Rabbits are social animals! They need relationships to thrive. One of the most important relationships a rabbit will ever have is with his caregiver. This foundational relationship will determine the quality of a rabbit’s life. Creating a connection with your rabbit is mutually satisfying and rewarding. Failing to take the time to develop a good relationship can result in unintentional neglect. How do you build a relationship with your rabbit? Won’t it just happen, like with a puppy or kitten? Probably not. Because rabbits are a prey species (unlike cats and dogs, both predator species) it takes a more deliberate investment on your part to build a relationship with a rabbit. A rabbit may start out as shy, afraid, very independent, or hesitant to trust you. It takes deliberate action on your part to build trust and mutual understanding with these sensitive, intelligent prey animals. 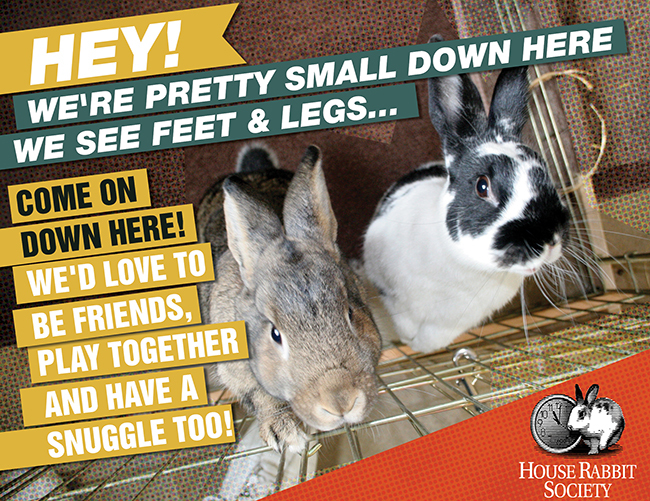 First and foremost: get on your rabbit’s level — compared to a human, rabbits are small. Most of the time it’s our feet and legs in their field of view. It’s hard to build a connection with a pair of legs. To build a relationship with your rabbit you’ve got to get on the same level. Sit or lie down on the floor. If the floor won’t work for you bring the rabbit up on the sofa or bed with you. Be Patient, don’t rush. It can take a few months for a rabbit to adjust to a new home and new people. Speak softly. Those big ears are good at conveying sound! Rabbits seem to enjoy listening to humans, as long as your voice is gentle and soft. Let your rabbit come to you. Rabbits are naturally curious. If you are quiet and patient she will come over and inspect you. Resist the urge to pet her right away. Let her explore you first, and learn that you are not a threat. Give a few small treats as you are getting to know each other. Eating is a social activity for rabbits and eating together builds trust. Small portions of carrot, apple, herbs, or oats are offerings a rabbit will appreciate. Hold your rabbit properly. And bear in mind that rabbits generally dislike being held. Rabbits are ground-dwelling animals who naturally fear being lifted from the ground by predators. Lifting and holding should be kept to a minimum. Although they don’t like to be picked up, most rabbits do desire physical affection. Most find petting, snuggling, nuzzling, and sitting companionably beside each other pleasurable activities. Play with toys together. Most rabbits are playful, and some games are great for two. Stacking cups, plastic baby keys, and wooden blocks are fun for tossing and knocking over. Be a rabbit — mimic the way two rabbit friends interact with each other, such as grooming or relaxing. 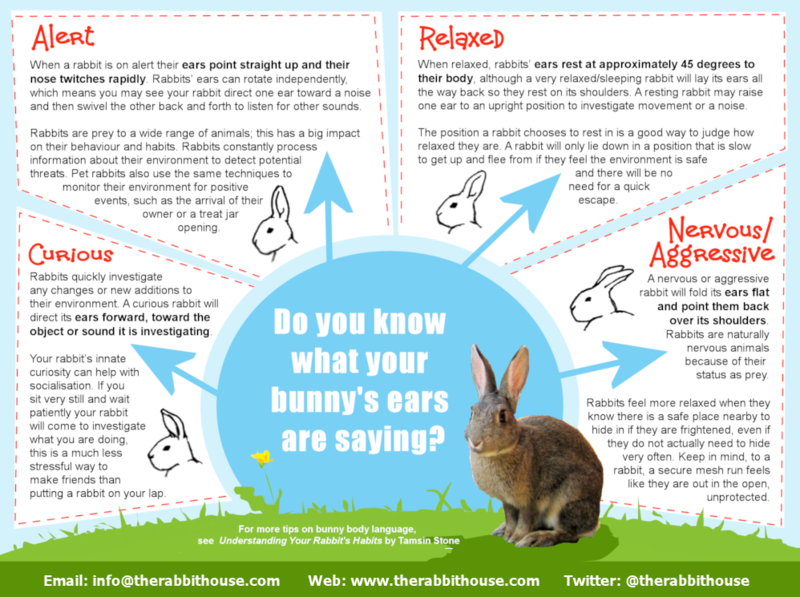 This is a good opportunity to learn about rabbit body language, and how rabbits communicate. Rabbits don’t bark like dogs or meow like cats (although some do make vocalizations), but their body language is diverse and clear. Each rabbit has a distinct and different personality. Many rabbits have BIG personalities. They run the gamut — some are easygoing and relaxed, some are active and demand attention, some are affectionate and engaged, some are fearful and territorial. Bonding with your rabbit will help you learn about and appreciate your rabbit’s unique personality. A rabbit won’t ever be a cat or a dog. A rabbit is her own special creature with many gifts to share.